Fall is one of my favorite times of the year. Not only do I love the pumpkin spice everything at Trader Joe’s but I love the finally cooler, crisp weather. Yet southern California is seriously lacking fall leaves. 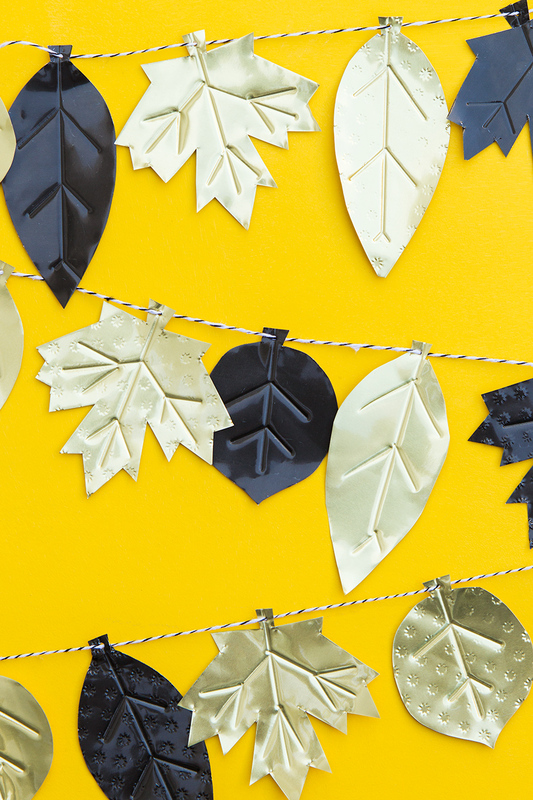 So instead of decorating my home with silk fall leaves, I opted to create this simple metal fall leaf garland. This DIY garland looks fancy but it’s actually really easy to make. Once you make one leaf, the next few will work up so quickly. If you love all things metallic, I definitely recommend investing in some of the metal working tools. There are just so many things you can do with these malleable metallic sheets! Print out the leaf template and cut out the leaves. Place one of the cut out leaves on top of a metal sheet and use tape to hold it in place. Cut around the leave shape. Optional (not shown in video): Place the leaf inside an embossing plate and roll the embossing roller all over the plate. Be sure to apply firm pressure so the plate makes a crisp print. Remove the metal leaf from the embossing plate and place it on the embossing mat. Use a ruler and the plastic end of the metal working awl to create small lines, or veins, on each leaf. You can refer to the lines on each leaf template for the pattern. Repeat steps 2-4 and create as many leaves and you live, alternating between leaves with embossed patterns and ones without. Use the sharp end of the metal working awl to create a small hole on the stem of each metal leaf. Then use a needle to carefully thread each leaf onto a long length of twine. Now hang your festive garland anywhere you like! Head over to my fall page to find tons of DIY ways to get your home ready for Thanksgiving—because it will be here before we know it! And if you want to put fall leaves on everything, check out the free wallpaper download that inspired this project. I love this pretty leaf garland! It’s so interesting that it’s made of metal, too!